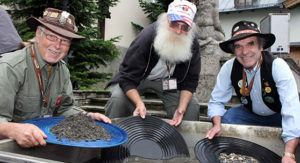 The 2015 World Gold Panning Championships were held in Navelgas, Spain. It was a grand affair, enjoyed by all. The United States was well represented. Rich, aka Uncle Fuzzy, and Joyce Mason were there, not only panning for the gold, but along with the entire contingent from El Dorado County ,representing the United States and the City of Placerville, California as ambassadors for the 2016 Championships. Placerville, California, not far from where James Marshall started the 1849 gold rush with the discovery of gold in the races of his saw mill on the South Fork of the American River, in January of 1848, is the perfect place for a World Gold Panning Championship. Placerville was a hub of the gold trade and merchants serving the gold trade for many years. It is located in the heart of Gold Rush country. We went to Spain and had a great time panning. Wonderful time, very good contest. We invited everyone to the Championship in Placerville, California in 2016. The 2016 World Gold Panning Championships will be in Placerville, CA, in September of 2016. Join us! Placerville or Bust!